Heat oven to 400°F. Place green beans and 1 tablespoon water in medium microwave-safe bowl; cover with microwave-safe plastic wrap. Microwave on HIGH for 7 to 8 minutes or until green beans are tender. Meanwhile, in ungreased 3-quart casserole, combine potato slices, contents of sauce mix packet, butter and boiling water. Stir in milk. Drain green beans. Add to potato mixture; mix well. Bake at 400°F. for 20 minutes. Remove from oven; stir in pork pieces. Return to oven; bake an additional 20 to 25 minutes or until potatoes are tender and lightly browned. Let stand 5 minutes; stir before serving. Look for smoked pork chops in the packaged meat case at the grocery store. 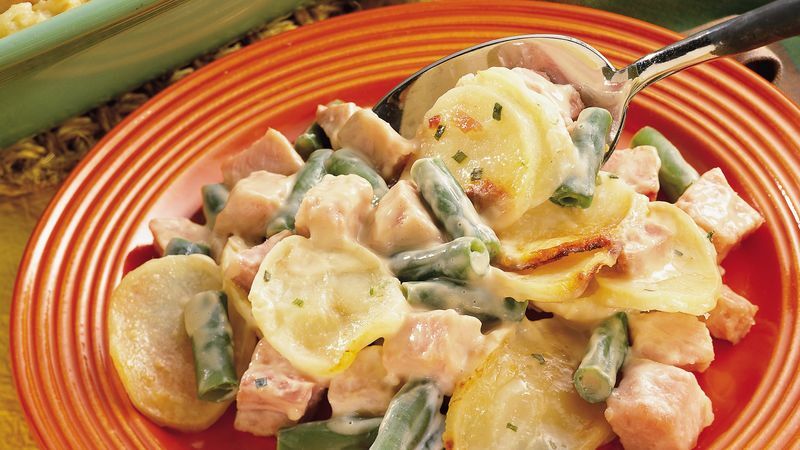 Creamy Scalloped Potatoes can be used in place of the Sour Cream and Chive Potatoes in this recipe. Pop some Pillsbury® Refrigerated Breadsticks in the oven to serve with this casserole.